ATLANTA, GA– December 16, 2015 – Crates & Pallet is home to products and projects featuring a variety of crates and pallets. Its winter project campaign, Clear the Clutter, features projects for the kitchen, pantry and closet. As part of this campaign, Crates & Pallet teamed up with eight bloggers, and are featuring their projects on their website and on their social media sites, with step-by-step project instructions. 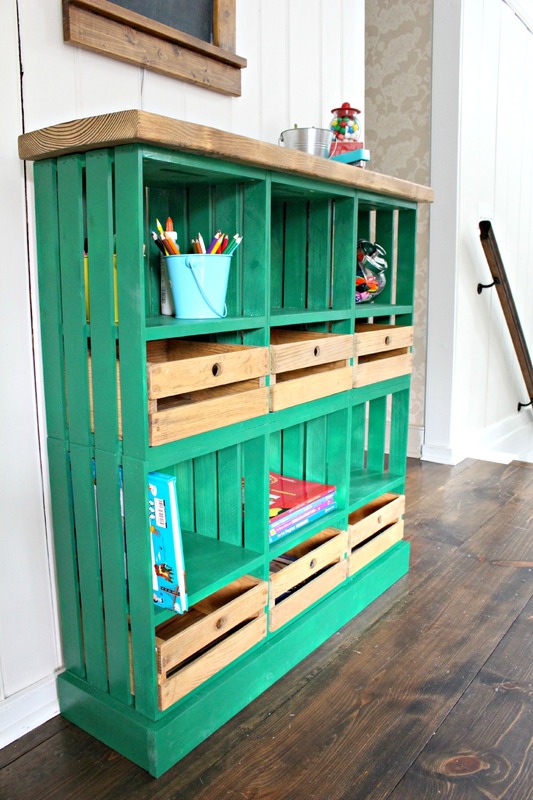 The bloggers’ projects centered around large crates from Crates & Pallet. 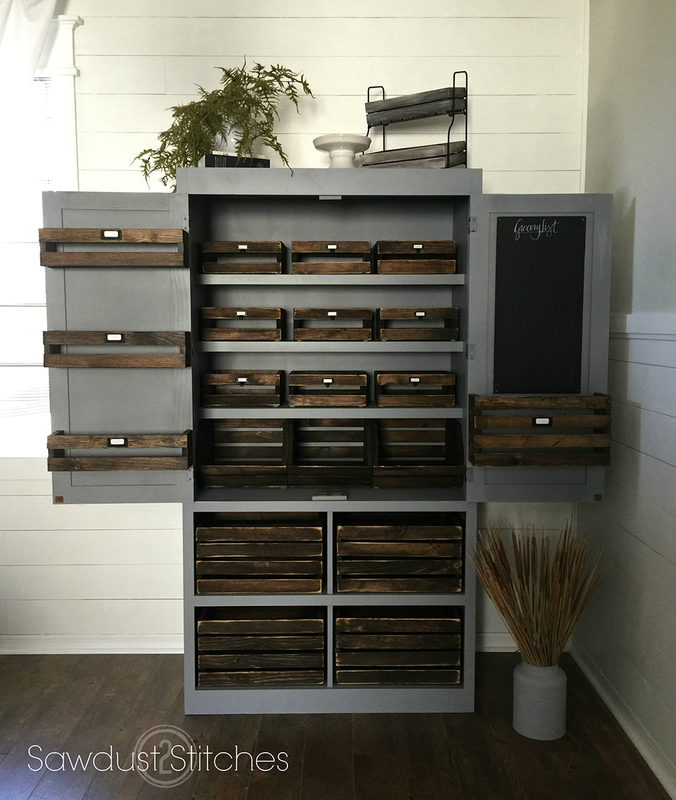 First we have a mudroom bench created by blogger, Jamie Costiglio of That’s My Letter (www. thatsmyletter.blogspot.com). 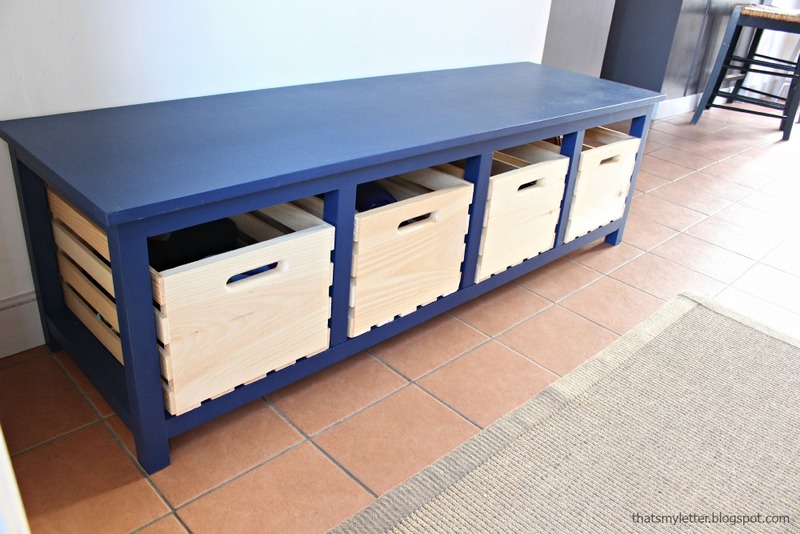 She used four large crates to make an attractive and practical storage bench to store hats, scarves, gloves, as well as things like games and toys. The bench makes a great place to sit to slip boots and other winter gear on and off, and easily put away before going into the main part of the house. The second project is a pantry made from crates. Sawdust 2 Stitches blogger, Corey Decker (www.sawdust2stitches.com), created this pantry to hold everything from spices to canned goods to paper goods. She used large crates, small crates, half wall crates, vegetable crates, and one tall wall crate. Next, this rolling kitchen island is the ultimate in kitchen organization. Mindi Carwin from My Love 2 Create (www.mylove2create.com) made this handy island with a variety of products from Crates and Pallet. Products included large crates, small crates, vegetable crates, and one each of the half crate, tall wall crate, and half wall crate. The sliding crate closet is a smart way to make the best use of space in your smaller closets. Brad Rodriguez from Fix This Build That (www.fixthisbuildthat.com) created this organized use of a hall closet. There is a place to hang your coats, store your vacuum and also organize games, hats, mittens, scarves, and many other items. The crates slide, so you can check them easily and put away what you don’t need, or grab something you do. Other clever organizational winter projects include a kid’s closet from Addicted 2 DIY (www.addicted2diy.com), a pantry makeover project from My Sweet Savannah (www.mysweetsavannah.com), a wine crate storage project from One Artsy Mama (www.oneartsymama.com), and a crate storage bench from Always Never Done (www.alwaysneverdone.com). Large crates used in these projects are available for purchase during the storage event at all Home Depot stores from December 24, 2015 to January 31, 2016, or are also found online with other Crates & Pallet crate sizes used in these projects at http://thd.co/1AjStQP. Crates & Pallet makes new crates and pallets in various sizes that are sold to major big box retailers. The company strives to keep up with current market trends in order to continue to provide valuable products that generate ideas and spark creativity. For more information on Crates & Pallet, please visit us at www.cratesandpallet.com or call us at 1-877-926-6464. For more photography, please visit www.cratesandpallet/news, and for more exciting projects, please visit www.cratesandpallet/projects or www.pinterest.com/cratesandpallet. ATLANTA, GA– November 17, 2015 – Crates & Pallet is home to products and projects featuring a variety of crates and pallets. Its holiday campaign, Sawdust & Snow, runs through January 1. As part of this campaign, Crates & Pallet teamed up with nine bloggers, and are featuring their projects on their website and on their social media sites, with step-by-step project instructions at http://bit.ly/1MkJDTh. In addition, the company has teamed up with RYOBI Nation and will feature several of the bloggers’ projects on RYOBI Nation. The bloggers will be competing for a prize by garnering votes, andRYOBI will award a $750 prize package for the blogger achieving the most votes for their project. The bloggers used mainly small and large crates from Crates & Pallet (please visit http://bit.ly/1MKDFvn to see the crates) to create cool holiday projects. First up is the Thanksgiving Dessert Buffet. Alison Ogden from The Pink Tumbleweed (www.thepinktumbleweed.com) designed a beautiful buffet display with two large crates and one small crate. 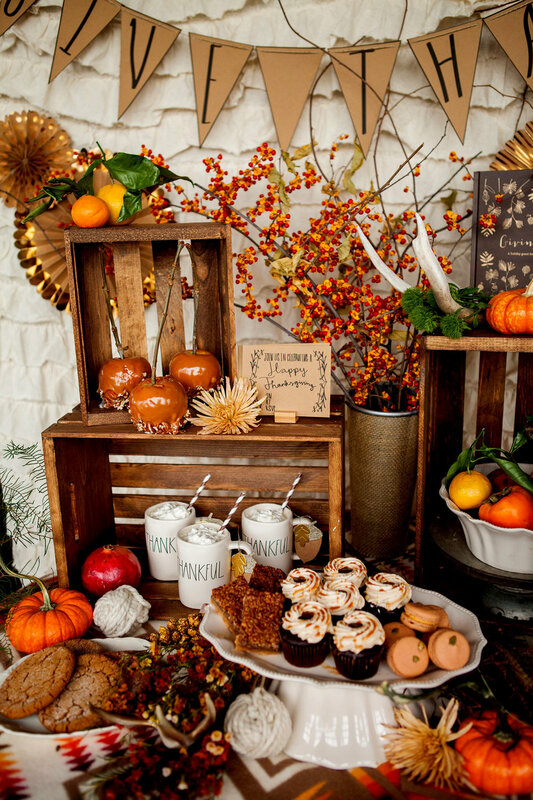 Painted to match the fall colors of your traditional Thanksgiving table, these upright crates hold desserts and décor to match. Everyone will want to sit at the kids’ table this holiday season with the Kids’ Crate Table Workstation. 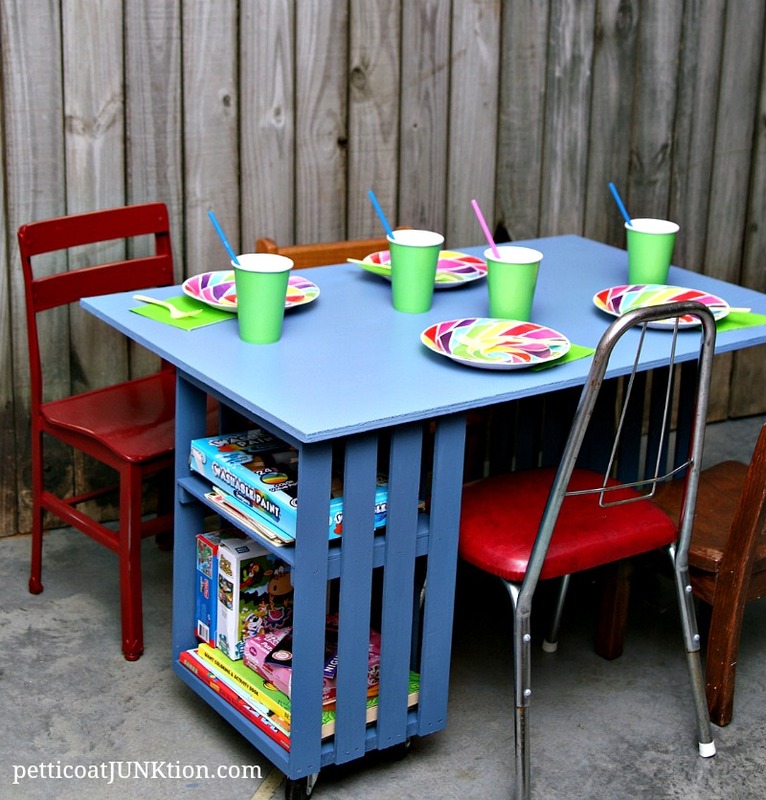 Kathy Owen from Petticoat JUNKtion (www.petticoatjunktion.com) created this fun multi-use table for kids using two large crates and one wine crate. Kids can eat, play or work at the table any time of year! 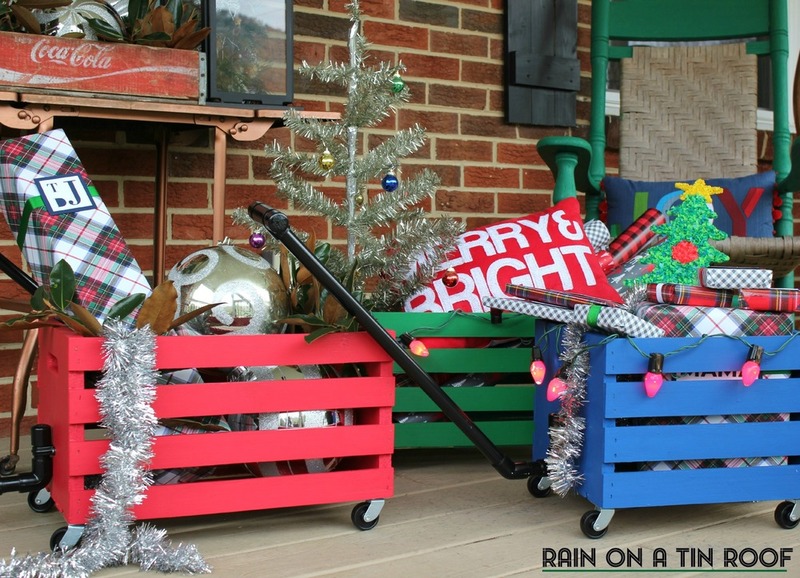 The next project is a holiday wagon designed by Jenna LeFeron from Rain on a Tin Roof (www.rainonatinroof.com). Jenna used three large crates to make three holiday wagons, complete with wheels and a handle. These wagons hold holiday décor, presents, blankets, pillows, and anything you want to store. She chose red and blue, and they could be painted any color for the holiday season, or you can display them any time. Functional and fun these crate wagons are sure to be a hit. This Christmas Village Display is a new twist on an old Christmas favorite, according to Katie Cleveland from Addicted 2 DIY (www.addicted2diy.com). She created these seven marvelous holiday scenes using five large crates and two square crates. This is the perfect place for your Christmas Village or any miniature scene for the holiday season. Other innovative holiday projects include an Advent Crate by Amy Latta from One Artsy Mama (www.oneartsymama.com) , a Personalized Hanukkah Gift Crate created by Karen Cooper from Dogs Don’t Eat Pizza (www.dogsdonteatpizza.com), a Gift Wrap Station from Amy Rattleff at Highstyle Restyle (www.highstylerestyle.com) , a Bookshelf and Centerpiece from Melaine Thompson (www.mysweetsavannah.com) and a BLANK by Amy Geib (www.alwaysneverdone.com). Large and small crates used in these projects are available online at http://bit.ly/1MKDFvn. Crates & Pallet makes new crates and pallets in various sizes that are sold to major big box retailers. The company strives to keep up with current market trends in order to continue to provide valuable products that generate ideas and spark creativity. For more information on Crates & Pallet, please visit us at www.cratesandpallet.com or call us at 1-877-926-6464. ATLANTA, GA - August 4, 2015 - Crates and Pallet is home to products and projects featuring a variety of crates and pallets. 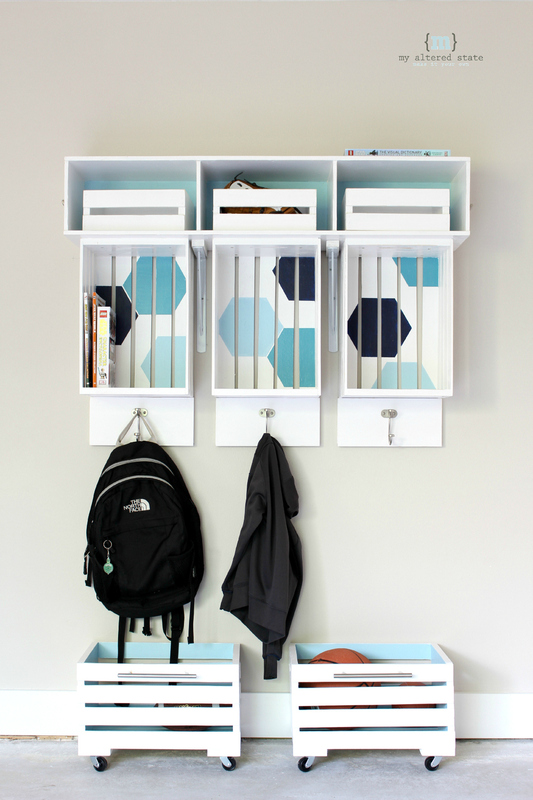 It's "Back to School Campaign" continues and is focusing on economical ways to add storage and decor to any dorm room. The company has recently built fun furniture and decor using its small and large wood crates and half pallets to outfit an entire dorm room. For just a little over $350.00 in Crates and Pallets products, using seven small crates, 21 large crates and two half pallets, this dorm room was transformed into a wonderful student home. Not only is this decorating on a budget, but a dorm room made up of wooden crates makes for easy moving the next school year! A half pallet was used to create a headboard for the bed, and hooks were added to the side to hang headphones or phone cords. Adding casters to large crates makes for easy and accessible under the bed storage. The crate desk fits perfectly into the room and is just one of many desk designs that you can build using crates. This one in particular is made using eight large crates for the desk frame and six small crates for the drawers. A half pallet was painted with chalkboard paint to create a wall calendar above the desk. The large crates also make great floating shelves above the bed. A scone was made out of a small crate by drilling a one inch hole at one end of the crate and attaching a pendant kit. After attaching the kit, you are able to screw in a lightbulb for a cool light! Finally, a leaning bookshelf was created by stacking five large crates in a ladder-like form. Two side panels with mitered ends raise the crates and allow them to lean against the wall. For more information and photos on the dream dorm room please, visit http://bit.ly/1IP5TJx. To see the dorm room come alive, check out this video: http://bit.ly/1DWoonP. ATLANTA, GA - July 8, 2015 - Crates and Pallet is home to products and projects featuring a variety of crates and pallets. Its national "Back to School" campaign starts today and runs through early August. As part of this campaign, Crates and Pallet teamed up with four bloggers, and are featuring their projects on their website and their social media sites, with step-by-step project instructions on their Blog. The bloggers used small and large crates from Crates and Pallet (please visit http://thd.co/1Gf75kl and http://thd.co/1DJ7j6U to see the crates) to create cool back to school themed projects. In addition, Crates and Pallet is featuring one of its own creations, a crate desk. "We're excited to showcase some new fun back to school projects and hope these projects will motivate DIYers and crafters to create projects with our crates for their home and dorm," said Kara Deason, Marketing Director for Crates and Pallet. "These economical projects will help organize your dorm room or room at home to store backpacks, lunch boxes, sports equipment, band equipment, and the list goes on." First up are cool Locker Cubbies by blogger Jaime Costiglio from That's My Letter (www.thatsmyletter.blogspot.com). Jaime says her kids really like them, and even though they are out of school for the summer, they have already filled them up with their school supplies. The Locker Cubbies were created out of six small crates and six large crates. Organize your family using these six cubbies and six drawers during the school year and all summer long to store crafts, books, pens, scarves or practically anything. There's no age limit on this piece and you can paint or stain it in any color you can image. Next is Mudroom Storage Cubbies. Pauline Henderson from My Altered State (www.myalteredstate.co) designed these cool pieces with five large and three small crates. Kids and adults of all ages will stay organized with these cubbies where they can hang up backpacks and jackets, store boots, books and sports equipment. Don't have a mudroom? No problem! These cubbies will fit in a closet, garage, or any area of your home. If you are short on space, these cubbies are long on organizing your space. Third on the list is the Garage Sports Organization Area made by Maryann Caballero from Domestically Speaking (www.domesticallyspeaking.com). This project organizes all of your sporting equipment and summer fun actives into one area- beach chairs, sand buckets, balls, tennis racquets, and other sporting goods are all in one place, so they are always easy to find. Maryann used two large, two extra large, two medium, two tall, and two vegetable crates to make this cool garage organizer. The fourth project is an Equipment Storage Unit. Designed by Melaine Thompson from My Sweet Savannah (www.mysweetsavannahblog.com), this handy sports equipment storage unit holds everything from sporting equipment, boots, totes, awards, and more. Melanie used six large crates to create this economical way to store all of your home athlete's gear year-round. And finally, the Crate Desk by Crates and Pallet was created with eight large crates with six small crates used for the drawers. Students of all ages can do their homework form this fun and thrifty desk. The easy design is one of several you can create using crates. Adults can use it in their office or it makes a great crafting desk. Dress up the drawers with cool handles and you can paint or stain it to match any decor. Large and small crates used in these projects are available at The Home Depot Stores (through August 5th or while supplies last) and always online at http://thd.co/100G1wG. Crates and Pallet makes new crates and pallets in various sizes that are sold to major big box retailers. The company strives to keep up with current market trends in order to continue to provide valuable products that generate ideas and spark creativity. For more information on Crates & Pallet, please visit us at www.cratesandpallet.com or call us at 1-877-926-6464.